① What do we alternate to create Music? We alternate Sound and Silence. ② Definition of the term 'sound'. Sound is a physical wave that our ears can detect. 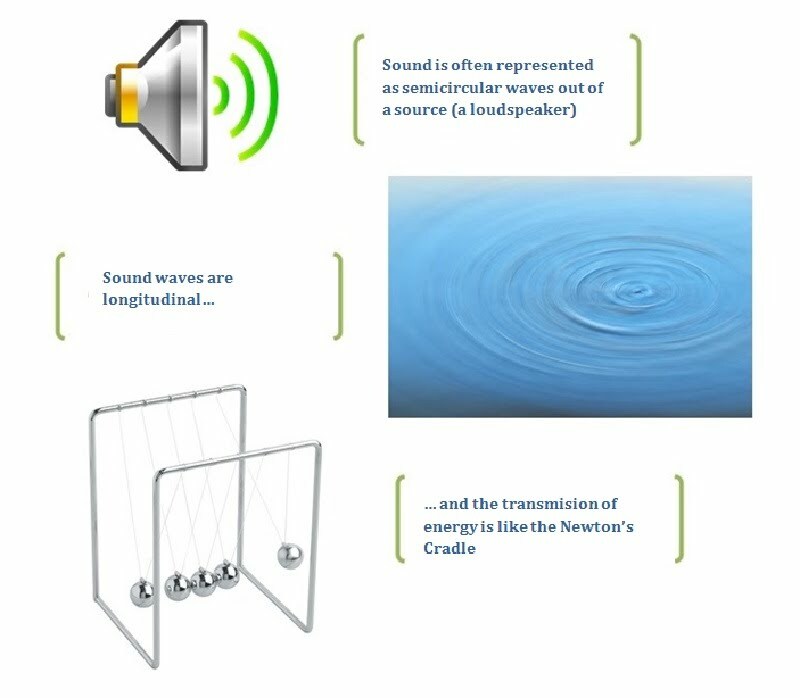 ③ If light and sound are both waves, why do we need eyes and ears for each of them and why what we feel it is so different? Because the frequency that hearing detects is much slower than that detected by sight. Sound and silence alternate to create Music, and the value of silence must not be underestimated, as a framework to sound, as part of the Music and as a reflection on what we have heard when the piece has finished. 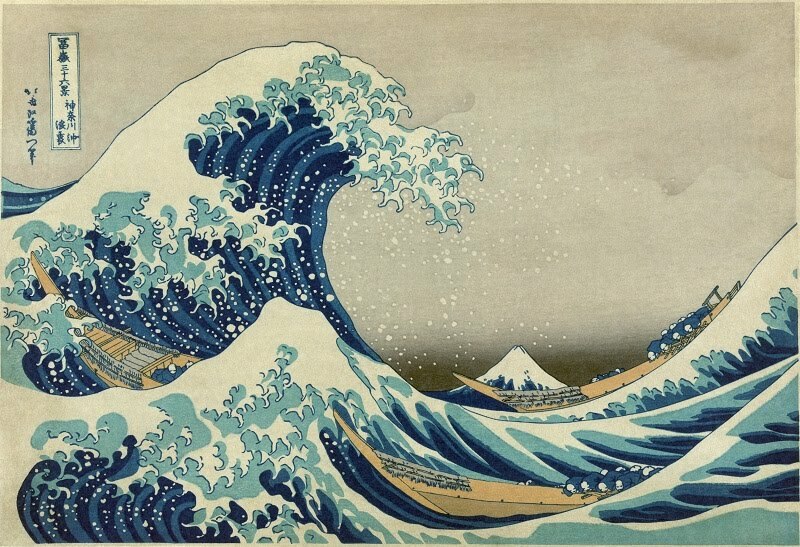 The Great Wave Off Kanagawa, by Hokusai. A hidden Yin and Yang. 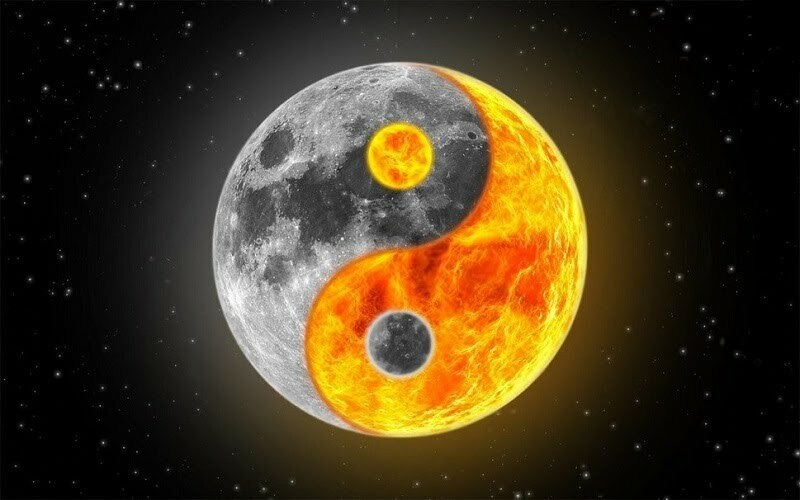 Sound and silence as Yin and Yang. And in the tatoo we can see the Yang as an empty space, like silence. 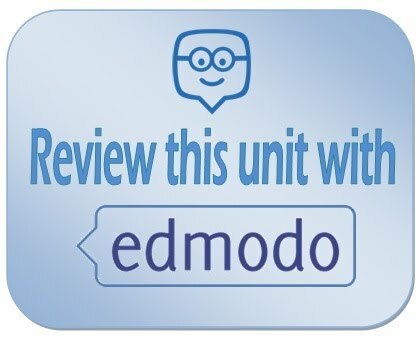 We must remember what we have learnt in the first unit: Silence is one of the requirements of a good quality listening and a barrier against noise pollution. Music can be created both treating sound in the style of a pottery work (as a DJ, a sound technician or a composer of electronic music) or joining element after element as a brick house is built (assembling small parts such as Music notes). Various performances of 4'33'' (1952), a work the composer John Cage (1912-1992) created only of 'silence' as a framework for listening to ambient sounds. ... and the equivalent in painting of 4'33'' could be the Suprematist works of Malevich (Black Square, 1915 and White on white, 1918). Sound is a physical wave that our ears are able to detect, as it vibrates at a certain speed (approximately between twenty and twenty-two thousand hertz). Read more about Ernst Chladni in Wikipedia. The information received by our different senses works in our brain as data files on the computer. We need an audio player for audio files and an image player to view photo and movie files. Both kind of files are a collection of zeros and ones, but the first does not work on the second player. In a similar way, a sound wave that vibrates a lot more than it normally does, would stop to be heard and would become a color. 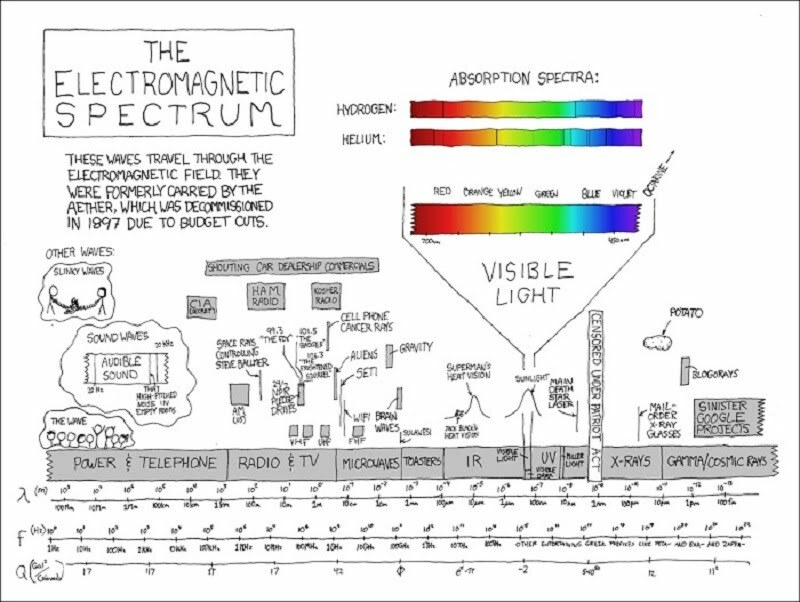 The difference lies in the different frequencies of the electromagnetic spectrum. ... and the spread of the energy produced. Energy is transmited as in a Newton's Cradle or Pendulum. The name of the notes in ascending and descending order, starting with G, A and B.
Fiddle Paradiddle - Exercises 17 to 24. (Day 1). 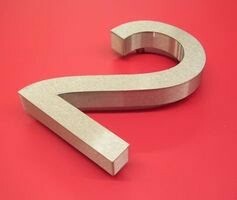 ① What medium does Sound needs to propagate? Sound employs an elastic medium (most often is air) to propagate itself. ② Path of the sound in our ears. Sound is collected by the pinna and passes through the outer ear canal until it causes the eardrum to vibrate. 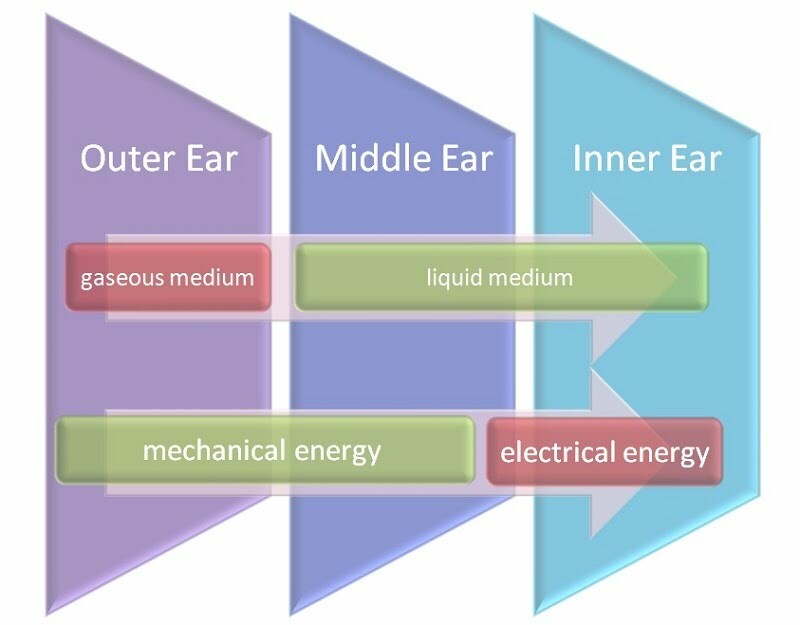 In the middle ear, that wave passes through a liquid medium which makes vibrate a number of small bones, transmitting the soundwave into the inner ear, where the brain decodes and transformes it into nerve impulses (electrical). 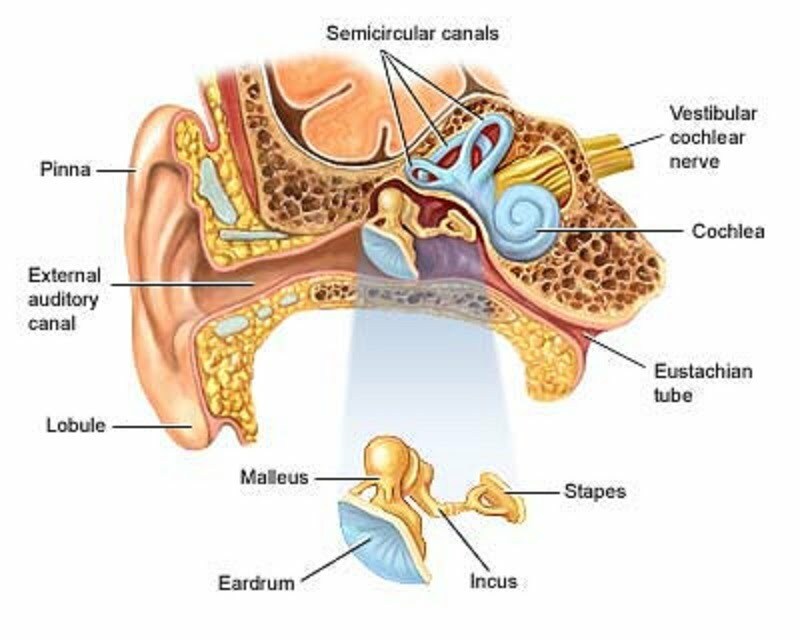 Sound is collected by the Pinna (or Auricle) and passes through the Outer Ear Canal until the Eardrum vibrates. In the Middle Ear, the soundwave passes through a liquid medium which makes vibrate a number of small bones, called Ossicles, transmitting that wave into the Inner Ear, where the Brain decodes them, transformed into Nerve (electrical) Impulses. When we hear a sound wave, our brain needs both our ears and the air surrounding the listener and emitter to feel and enjoy the sound. The sound always uses an elastic medium to propagate. 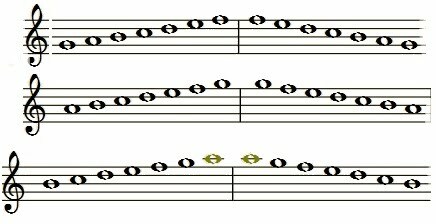 Fiddle Paradiddle - Exercises 17 to 24. (Day 2). ① Elements of Sound (I): Duration, Space and Intensity. Duration is the presence of sound over time; Space is the sound location or place where it is originated; and Intensity is the maximum distance of propagation of sound (related to volume and piercing sound). ② Elements of Sound (II): Timbre and Pitch. Timbre is what makes each type of instrument sound different; and Pitch is the frequency of sound in Hertzs and classified in treble and bass. The sound has five inseparable elements. One can not exist without the other. 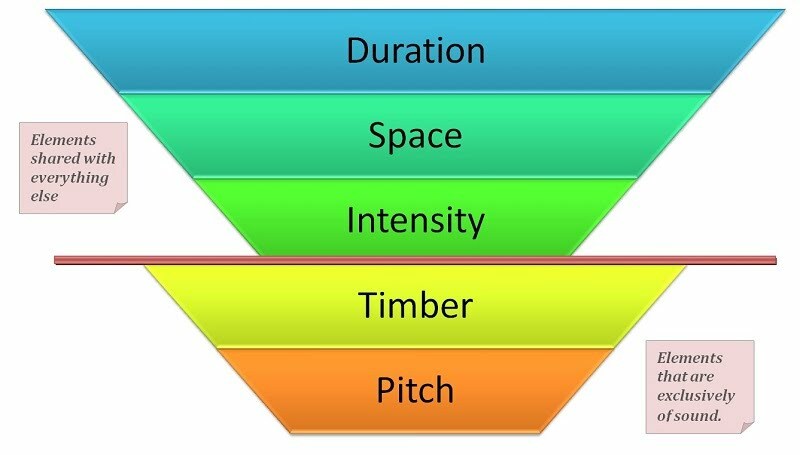 These are Duration, Space, Intensity, Timbre and Pitch. Some elements, such as the duration, space and intensity are shared with many other things, like light - even life. But timbre and pitch are unique and exclusive elements of sound. Imagine you have a CD that has no duration (sounds for zero seconds), space (no room), intensity (volume at zero), timbre (no CD) and height (the CD is blank). In any case you are not going to listen anything. Groups of three consecutive ascending notes. 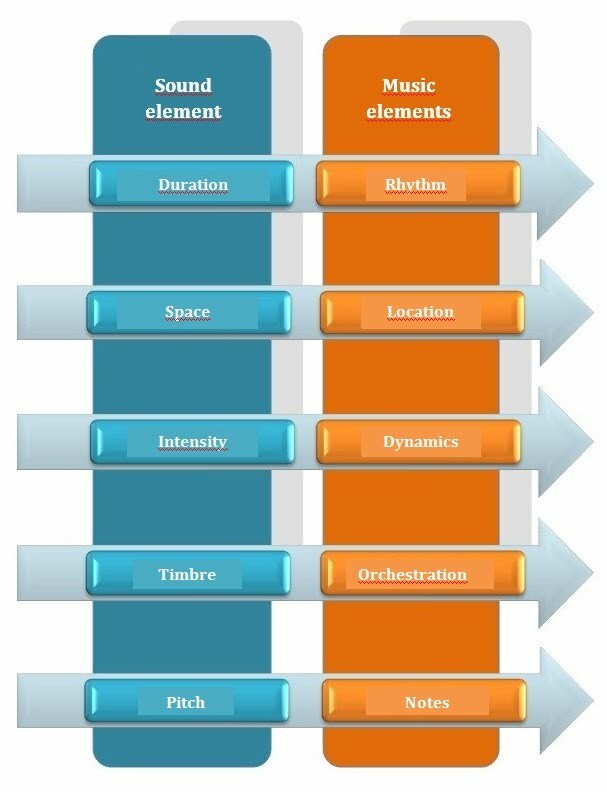 ① Translate the elements of sound in music elements. 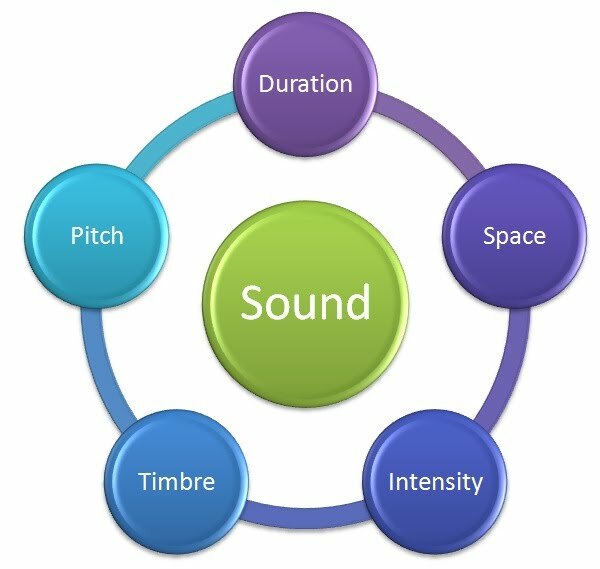 Duration - Rhythm, Space - Sound localization, Intensity - Dynamics, Timbre - Timbre or Orchestration and Pitch - Musical Notes. ② Name the first five elements of Music. Duration, Location, Dynamics, Orchestration and Notes. 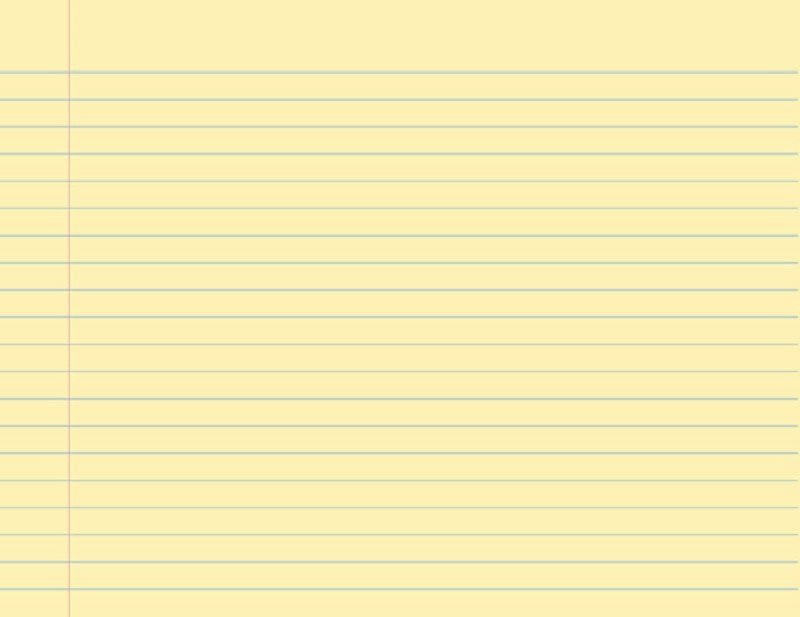 ③ Why can we compare silence with a blank sheet of paper? Because silence is like a white paper where we capture the sound. ④ Name the first five elements of Music. 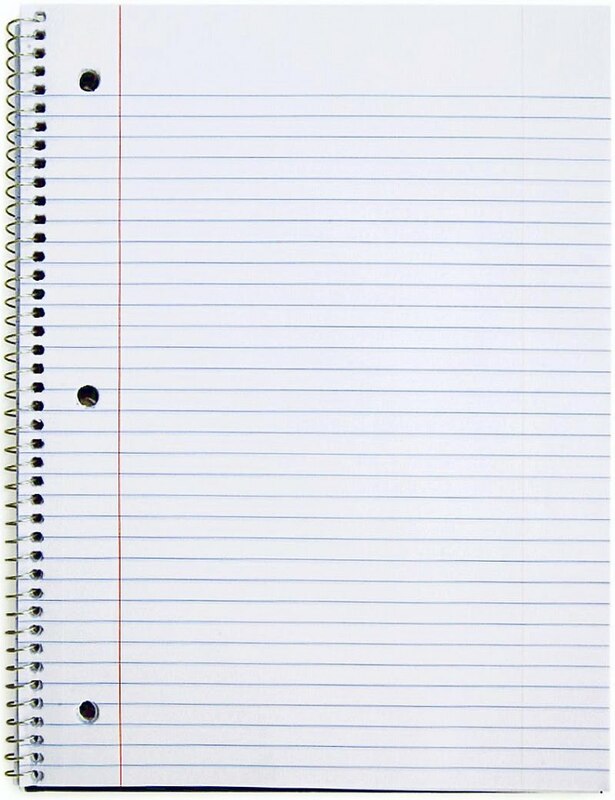 ⑤ Why can we compare silence with a blank sheet of paper? The following table shows how each of the elements of sound has its musical equivalent. There are many more Music elements and we will learn from them the next grade, but we can start with the most important this year. As we can see in this graphic, each of the basic elements of Music is based on another element of Sound. Undoubtedly, they form pairs as Sound is the key element of Music. 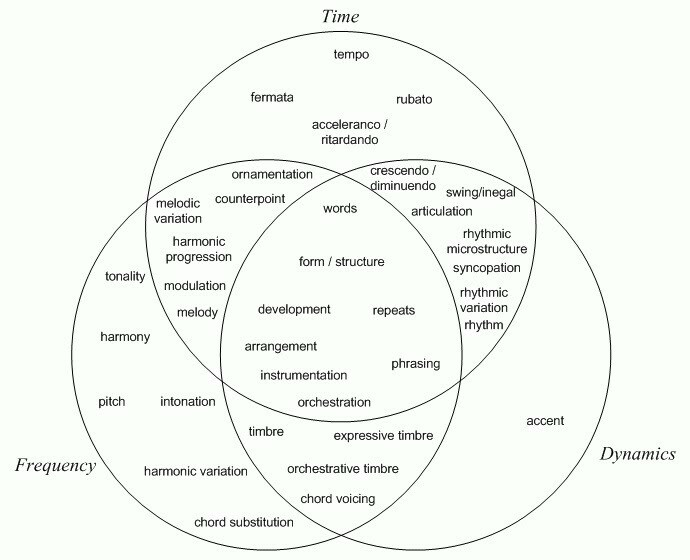 Diverse Music terms related to Time, Frequency and Dynamics parameters. And now a video about the Elements of Music (as you can see there are more than the five we have studied in this Unit). And another video where we can see how all elements come togheter in an integrated form to create a song. We already know the first five elements of Music that came straight out of the five elements of Sound. Let's see what their definitions are. The duration of musical notes and their respective rests. It consists of short and long elements and their subdivisions. A rhythmic pattern is generated when these elements create a regularity. The place of the musicians on stage. Along with the dynamics location gives depth to the Music. The guitar duel needs an stereo image to separate both instruments. The relative intensity of each of the notes in the context of the musical texture. With contrasting dynamics in a simultaneous or consecutively manner, a composer achieves the possibility of highlighting the melody that has the highest intensity. Ernie and Bert sing "Loud and Soft"
The music is made with instruments and both of them are inseparable. Knowing how to write for each of them and give them appropriate parts is the orchestration. 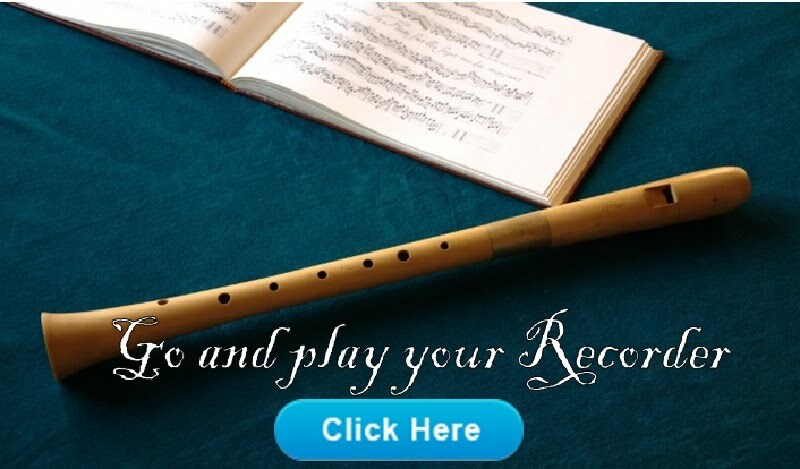 Listen how the instruments of the Orchestra comes one after another. The different pitches. Each octave in halftone intervals has twelve different notes. As a curiosity: a piano has eighty-eight keys. The intensity makes pay attention to a portion of Music, as it highlights a sound or a silence. Dynamics are an artistic resource that allow us to rise or to lower the overall intensity and because of that, it creates layers of sound. The orchestration and timbre have a function that is to allow each instrument to have a position and a part in the piece, selected by the qualities of the kind of sounds those instruments produce. The common way to indicate the pitches or frequencies is through musical notes and we can consider the space as the location of each musician on stage and the place the sound is being originated. Download a pdf about the Elements of Music.